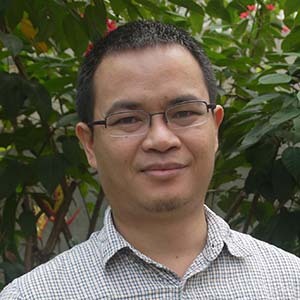 Dr. Sonny Mumbunan is an economist and research scientist at the Research Centre for Climate Change at the University of Indonesia. He was trained in the issues of environmental appraisal and policy formulation at the New University of Lisboa, Portugal, in behavioral economics at the University of Mannheim, Germany, and in environmental governance at the Norwegian University of Life Sciences, Norway. Sonny Mumbunan holds an M.Sc. in Empirical Economics and Policy Advise from Martin Luther University Halle–Wittenberg (2008) and wrote his dissertation on ecological fiscal transfers in Indonesia at the Helmholtz Centre for Environmental Research (UFZ), which he submitted to the University of Leipzig, Germany (2010) for a Ph.D. in economics (dr.rer.pol.). Economic instrument for ecosystem service compensation, policy analysis of climate change mitigation and adaption measures, public finance and extractive industries are among his research interests.